We’ve set our goal. We’ve got our eyes fixed on what we want. Life somehow just gets in the way. Sure, we still want to achieve our goal. But we’re busy. It’s just not the ‘right time’. So, we tend to reassure ourselves, that we will start on Monday, next week, next month. Ultimately hitting pause on our big dreams. The truth is, there is no ‘right time’. Now is the only time we have control over, and there will only ever be 24hrs in a day. So, what can we do about it? The secret is making small changes every day. 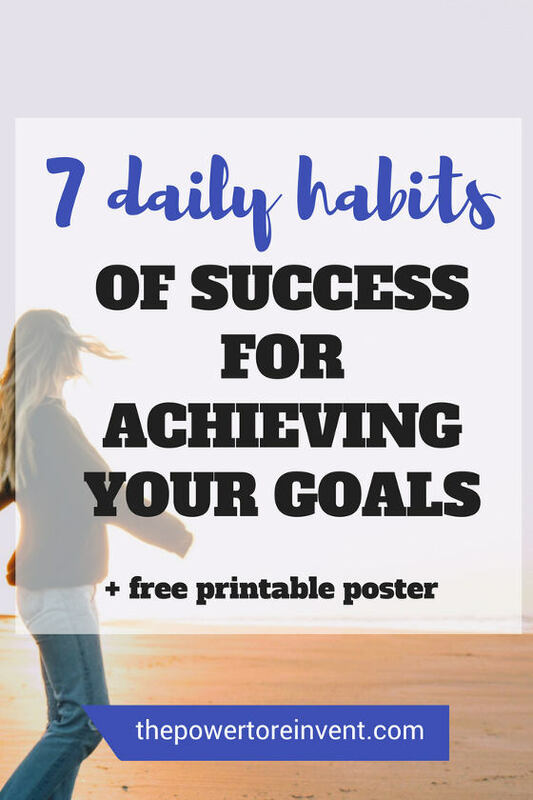 We’re excited to be sharing 7 daily habits of success (perfect for busy lives). You’ll be gliding towards your goals, in no time. As a goal setting expert. I have used these habits in my own life and seen, first hand, the incredible results in my client’s lives. These 7 habits truly are the habits of highly successful people. What are the habits of Success? Daily habits don’t have to be time consuming or expensive to be full of power. The daily habit of writing down your goal can increase your chances of achieving your goals. 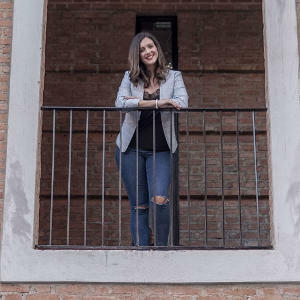 Best selling author, Henriette Anne Klauser, shares a number of incredible stories that show the power of writing down goals in Write It Down, Make It Happen: Knowing What You Want And Getting It . We love this daily habit for success. It takes seconds, costs virtually nothing, yet has the most amazing impact. 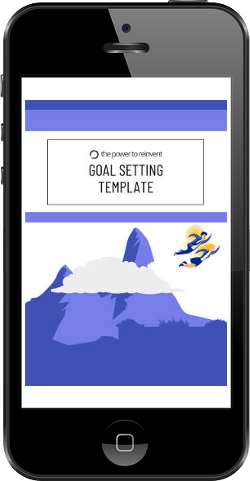 If you want to learn more about the science behind writing goals check out our post on why you should be writing down your goals. Number two in our daily habits list is visualisation. Visualising your goals as if they’ve already happened, is extremely important for achieving your goals. For instance, if you have a dream to become an entrepreneur you might see yourself receiving a round of applause at your launch. Picture your bank balance or imagine yourself on the vacation of your dreams. Whatever your daydream, make it incredible, vivid and compelling. We love this habit of success as it uses The Law of Attraction and is the perfect activity any time of the day. Whether you are daydreaming over coffee, in the bath or on the commute home. It’s free, fun and incredibly motivating. If you are seeking some inspiration check out these 4 successful celebrities who use the power of visualisation here. One of the most powerful of our daily habits, is practising the art of saying no. Now, this habit can make many of us people pleasers very uncomfortable, so let’s clear a few things up. No, is not a bad word. Saying ‘No’, does not make you selfish. Using ‘No’, goes a long way in helping you achieve your goals. All we need to say is ‘no, I am not able to do that’. The end. No reasons, no justification – you do not have to defend your ‘niceness’. We control our day. We decide what goes into our 24hr and what doesn’t. And each day we make a choice. Are we using our energy to facilitate our dreams? Or the dreams of others? We love this habit of success because saying ‘no’ is a way of honouring yourself. It increases the time available to achieve your goals. In fact, the more we use no, the more we will discover ourselves, tuning into our strong inner voice. Ultimately, we are happier, less frazzled and able to support others when they need it. However, if you feel like you need a bit more help in this area check out The Power of a Positive No: Save The Deal Save The Relationship and Still Say No by William Ury. Gratitude is one of those daily habits, that is on the increase because it works. In our frantic world, it’s easy to race from one thing to the next. Comparing yourself to your friends or others on social media along the way. Often, it’s easy to look at what we don’t have, rather than be grateful for what we do. For this reason, practising gratitude can be an extremely powerful daily habit. It keeps us focused, grateful and enables us to appreciate what’s going well in our lives. We love this habit of success as it only takes a few minutes at the end of each day. Simply reflect and write down three things that you are grateful for. As a direct result of this daily habit, you will see a boost in your mood as you mindfully enjoy the journey to achieve your goals. When life gets in the way of our goals, it can be confusing where we should direct our attention. What activity should I say no to? What is important and what is not? This is where the WIIDX2 formula comes into play. What’s that I hear you say? Well, it’s an incredibly powerful tool and a must-have habit for success. WIIDx2 is an acronym for ‘What if I did’ / ‘What if I didn’t’ that is used frequently in Neuro-Linguistic Programming . It’s a powerful, quick way to understand if a particular action will help in reaching your goals. While you might not call upon it every day, we love this habit of success as it saves so much time. It puts a stop to endless internal debates with yourself. This technique effectively evaluates the consequences of your actions keeping you on the path to success. As humans, our minds dislike delayed gratification. Studies by psychologists have proved that smaller rewards on the journey to big goals, really helps boost levels of commitment. Ask yourself what did you do today that moved you towards your goal? Or what valuable lesson did you take from the day? We love this habit of success because it’s simple, easy and can be combined with gratitude practice. Reflecting on the small steps you have made is rewarding. And over time you will see how they all add up to make the big change you want to see in your life. Often when people think of achieving goals, they think of smashing it, crushing it and burning the midnight oil. And sure, for a small handful of people perhaps that works. But we at The Power to Reinvent firmly believe in balance over burnout. To achieve your goals is about working smarter, not harder. And one daily practice to boost performance is a good night sleep. Sleep is essential, not an option. Studies have shown the impact on performance that lack of sleep can have. In fact, sleeping just five hours a night, instead of seven can lead to poor motivation, concentration and reaction rates (Carskdon, 2011). On the flip side, a good night sleep can improve memory and performance. We love this habit of success and it is such simple, vital ingredient for achieving goals. Top Tip: A few years ago, I created a sleep routine. It was after watching an interview with Nick Littlehales, the Sports Sleep Coach. Nick has worked with a lot of high profile clients. Particularly in the world of sport such as Bradley Wiggins, Cristiano Ronaldo and Manchester United. The 90 minutes pre-sleep routine is just one of the methods Nick uses with his clients. But it is very effective — I can vouch for that. In the last 90 minutes of the day, it is important to prepare for sleep by slowing down. This helps with better quality and refreshing sleep. Learn more about sleep and the other techniques Nick uses in Sleep: The Myth of 8 Hours, the Power of Naps, and the New Plan to Recharge Your Body and Mind . And you can do it all with your eyes closed….. 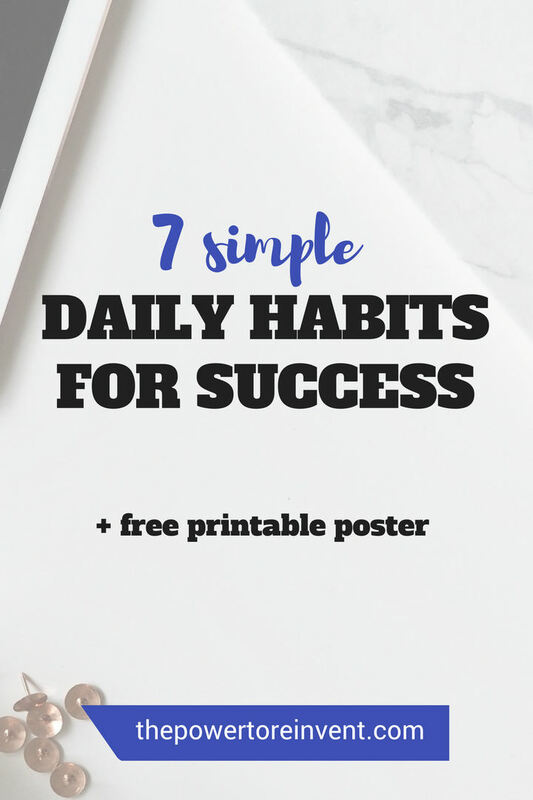 But on an important note, we have loved sharing our 7 daily success habits with you. How do you develop the habits of success? Good personal habits are an essential ingredient to achieving goals. These small acts every day go a long way in creating our success and the life we dream of. However, if you are left wondering how do you develop the habits of success? Just like any behaviour or ritual, we learn it through repetition. In the same way, you got in the habit of getting up to go to work, school or brushing your teeth. With practice, these habits of success will quickly become part of your life. We suggest starting out with one or two from the list and building on it. 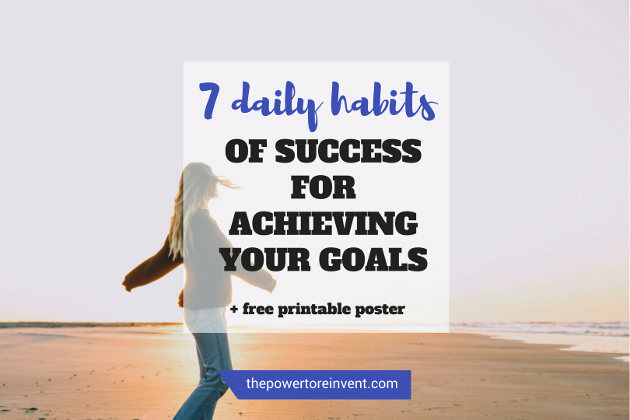 Our 7 habits of success are designed to be easily achievable and fully within your control. No fancy gadgets, courses or programmes required. To help keep you motivated to take small steps, every day, we created this beautiful motivational poster (large letter and A4 size). This can be yours for free! 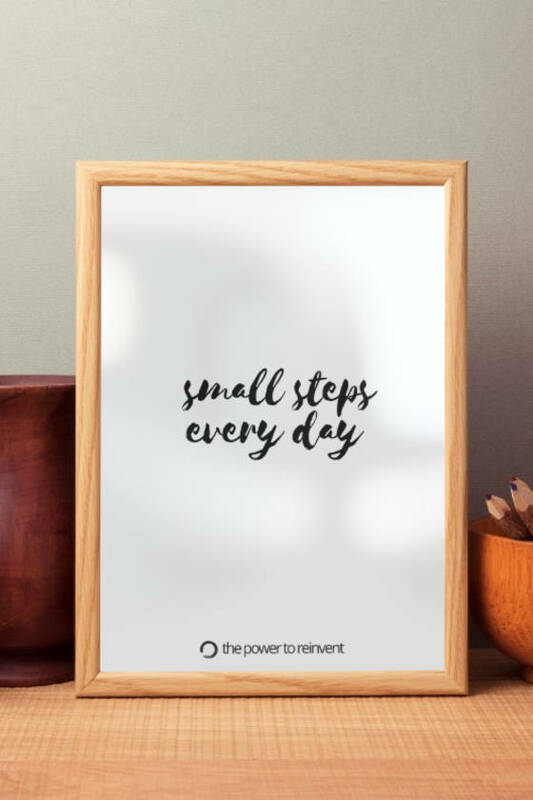 To download our free “small steps every day poster” and get access to all of our other great free goal setting resources, enter your email below. Download it, print it and keep it as a visual reminder that “Success is the sum of small efforts, repeated day in and day out” — R. Collier. It’s just small steps, every day. Finally — we would love to hear from you! What habits of success do you practise that help you move closer to your goals?